Recognizing that science and exploration go hand in hand, NASA created SSERVI in 2013, expanding the scope of the former NASA Lunar Science Institute to include basic and applied scientific research on the Moon, near Earth asteroids, and the Martian moons Phobos and Deimos. The Eugene Shoemaker Distinguished Scientist medal, Michael J. Wargo Award, Susan Mahan Niebur Award, and Angioletta Coradini Award recognize outstanding achievement in exploration science. The winners are nominated by their academic peers and are selected by SSERVI Director, Dr. Yvonne Pendleton. The awards will be presented along with invited lectures from the recipients at the 2018 Exploration Science Forum (ESF) taking place June 26-28 at the NASA Research Park at NASA Ames Research Center in Moffett Field, Calif.
Dr. Dyar has had a distinguished career spanning more than 30 years in which she authored 242 peer reviewed publications. 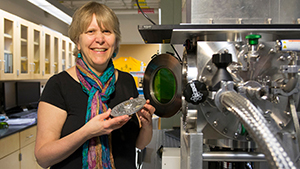 Darby’s expertise are numerous, including optical mineralogy, crystal chemistry, and numerous spectroscopic techniques. In recent years she has also revolutionized the use of machine learning techniques in the analysis and interpretation of X-ray absorption spectra. The careful laboratory work and model development that she has led throughout her career have enabled thousands of other papers that have utilized the data she has generated; her work will prove to be substantially more important than any single mission. 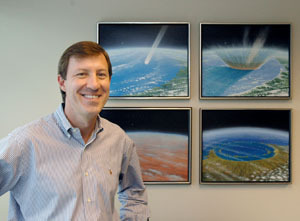 Without Dr. Dyar in our field for the last 30 years, our understanding of planetary processes and the interpretation of various mission data would be much poorer. The Michael J. Wargo Exploration Science Award is an annual award given to a scientist or engineer who has significantly contributed to the integration of exploration and planetary science throughout their career. Dr. Michael Wargo (1951-2013) was Chief Exploration Scientist for NASA’s Human Exploration and Operations Mission Directorate and was a strong advocate for the integration of science, engineering and technology. The 2018 Michael J. Wargo Exploration Science Award is given to Dr. David Kring at the Lunar and Planetary Institute in Houston, Texas. 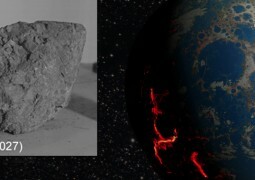 Dr. Kring’s research explores the origin of the solar nebula and its evolution into a geologically active planetary system; the geologic history of the Earth, Moon, Mars, and several smaller planetary bodies; impact cratering on the Earth, its effect on Earth’s environment, and its possible role in the biological evolution of our planet; and the chemical and physical properties of meteorites. He is currently integrating his field experience in impact-cratered terrains with his analytical experience of Apollo, Luna, and lunar meteorite sample collections from the Moon to lead the development of spacecraft missions in response to the President’s lunar exploration initiative. The 2018 Susan Mahan Niebur Early Career Award is an annual award given to an early career scientist who has made significant contributions to the science or exploration communities. Recipients of the Susan M. Niebur Early Career Award are researchers who are no more than ten years from receiving their PhD, who have shown excellence in their field and demonstrated meaningful contributions to the science or exploration communities. 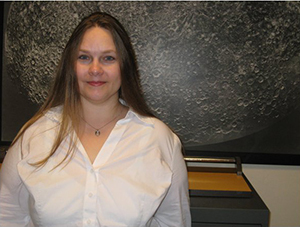 Susan Mahan Niebur (1978-2012) was a former Discovery Program Scientist at NASA who initiated the first ever Early Career Fellowship and the annual Early Career Workshop to help new planetary scientists break into the field. This year the prize is presented to Dr. Rachel Klima at the Johns Hopkins University Applied Physics Laboratory. 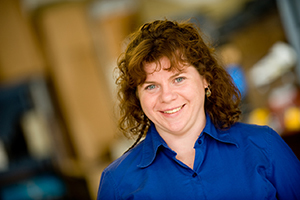 Dr. Klima is one of the premiere airless body spectroscopists of her generation, with published papers about the Moon, Mercury, Vesta, and other asteroids. Her general expertise in spectroscopy and lunar data has led her to lead and participate in studies of other materials as well, most notably lunar water and hydroxyl. Outside of published papers, her knowledge has put her in great demand—she has been sought after to play important roles in proposed missions. Currently she serves as a member of the project science team for the Europa Clipper mission. She has won a Carl Sagan Early Career Fellowship from NASA, showing that her promise has been widely recognized. The SSERVI Angioletta Coradini Mid-Career Award is given annually to a mid-career scientist for broad, lasting accomplishments related to SSERVI fields of interest. Angioletta Coradini (1946-2011) was an Italian planetary scientist who has inspired astronomers around the world. The 2018 Angioletta Coradini Mid-Career Award is given to Dr. Barbara Cohen at NASA Goddard Space Flight Center. Dr. Cohen’s main scientific interests are in geochronology and geochemistry of planetary samples from the Moon, Mars and asteroids. She is a Principal Investigator on multiple NASA research projects, a member of the Mars Exploration Rover mission team still operating the Opportunity rover, and the principal investigator for Lunar Flashlight, a lunar cubesat mission that will be launched in 2018. She has participated in the Antarctic Search for Meteorites (ANSMET) over three seasons, where she helped recovered more than a thousand pristine samples for the US collection, and asteroid 6186 Barbcohen is named for her. The SSERVI awards are open to the entire research community; recipients need not reside in the U.S. nor be a U.S. citizen. Nominations are welcome at any time at: https://sservi.nasa.gov/awards/submit but must be submitted by March 31st for consideration in that calendar year. Winners are formally presented with the awards at the annual Exploration Science Forum each summer.